In today’s ever-changing world of education, finding the right path to innovation can be a constant and overwhelming challenge for educators, administrators and communities alike. For Microsoft Expert Educator Terry Byers, it has been finding the right balance of innovation that makes the difference. As director of innovation in learning at the Anglican Church Grammar School, Byers has not only pioneered his school’s 1-to-1 program, he is also uncovering groundbreaking insights into the classroom environment, how technology should be effectively integrated, and how best to use technology to increase a student’s performance. According to Byers, significant innovation has been gained from their mathematics and English courses. He notes that these largely traditional and high-stakes subjects have seen, in some cases, a transition away from the “teacher-centered and didactic transmission-style pedagogy,” which Byers says is more suited to the “factory schooling system of the 1930s to 1950s.” This shift in pedagogy, combined with inventive changes to their physical classroom spaces, has significantly impacted outcomes. I hope you enjoy today’s Daily Edventure with Expert Educator Terry Byers. Because I didn’t want to be an engineer, like everyone else in my family! But I have seen that those who love what they do (and don’t mind coming to work on a Monday) get some form of intrinsic value from their job. My most significant achievements have been the attainment of an Australian Postgraduate Award research scholarship and my selection as one of three PhD researchers in the University of Melbourne’s 2013-2016 Australian Research Council grant, “Evaluating 21st Century Learning Spaces” (E21LE). E21LE brings together the collective expertise of secondary and tertiary institutions and leading international architectural firms. E21LE will enable the evidence-based research approach conceived, trialed and refined at Churchie to be applied in schools throughout Australia. The aim is to verify the positive effects of the requisite synergy between technology, pedagogy and the formal learning space on teacher practices, student engagement and learning outcomes. The intent is to address the current evidence gap related to the relationship between space, technology and pedagogy in a school setting. To date, these findings have been shared at both domestic and international conferences, including a number of invitational keynotes in 2014. The most exciting innovation happening at Churchie at the moment is our research, with the University of Melbourne’s Graduate School of Education, around the influence of the physical space to support the affordances provided through ubiquitous access to technology. This work has centered on the creation of New Generation Learning Space (NGLS). These spaces are existing classrooms that have been modified through cost effective alterations that adapt the physical attributes of the space. The aim is to support the integration of digital technology and facilitate more contemporary pedagogical practices. This research has involved “making the case for space.“ This has been proven through the empirical data collected through a series of experimental studies that have measured the effects of various interventions on both teachers and students. A key facet of these experiments has looked at how the alteration of the physical environment better supports the integration, use and effectiveness of our 1-to-1 tablet PC program. From our work we have proved that our program, in our NGLS, has had a statistically significant and positive effect on student perception of the effectiveness of their device as a learning tool; teachers’ practice; the level of student engagement; and learning outcomes. We have utilized this work at Churchie as the foundation for a large, federally funded Australian Research Council (ARC) Discovery Grant between the University of Melbourne, several schools and world-renowned architectural firms. We are also utilizing this research as the data-driven basis in and for the creation of a multi-disciplinary creative precinct and our new library and student services facility. Both buildings are, and will be, revolutionary spaces within the K-12 education sector both in Australia and worldwide. Creativity and innovation, as these require the other 21st century skills. Our students must have a tool kit of skills that allow them to take their knowledge base and apply this in novel or complex tasks, if they are to be successful in their post-school environment. I am unaware of any jobs that require individuals to work in isolation, complete pen and paper multi-choice assessment or spend time solving problems that have already been solved. I feel that a tablet PC is the optimal device for students. Handwriting is still and will always be a required and pertinent means of communication. The optimal device for education then is a tablet PC that combines the positives of the other devices in a single form. Also, due to my heavy reliance on Microsoft OneNote as the backbone of our 1-to-1 program, we continue to see the value of a Windows platform. In Australia we are at the end of significant systemic funding that focused on the provision of digital devices to secondary school students. The success of this program has varied. However, the schools that wisely invested in forward thinking infrastructure are still making quality educational gains, even after the end of this funding. Many utilized the funding of student devices to explore more widespread pedagogical and curriculum change. However, due to the nature of the funding and the current government’s roll back of the program, the success of the integration of digital technology sits solely with individual schools to both fund and sustain their initiatives. Many schools, like Churchie, who managed and facilitated their own programs initially, are continuing to make positive educational gains. Unfortunately this is a school-by-school case. In Australia we need a system that treats teachers as the professionals. Comparative PISA testing clearly indicates that those countries that treat, and require, their teachers to be professionals, have the highest student learning outcomes. This is due to the undisputed fact that the classroom teacher is still the single most important factor in ensuring quality student learning outcomes. Many of these countries have also heavily investigated in digital technology as a valuable teaching tool. This means that it is not just a tacked on commercial product, but something that adds value to the teaching and learning experience. Another common thread is that these countries require teachers to undergo regular professional development and provide sufficient in-school time for collaboration and mentoring. Dogged determination, time and strong leadership. Change in education is very hard. From my research, it is clear that wave after wave of reform attempts have not made a dent in the factory schooling model. A key factor is the inherent nature and social construction of what constitutes a “school,” “the classroom” and “effective instruction” that is an underlying factor in this continuation. Nothing typifies this more than the spatiality of the industrial age classroom. It reinforces both societal, cultural and pedagogical norms that only exist within education today (i.e. the teacher is the sole source of finite information). 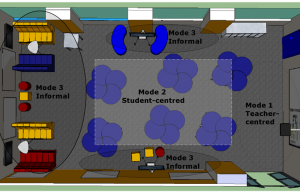 At Churchie, we have found that through minor and simple modifications to the classroom (i.e. trying to remove the perceived “front” and allowing the teacher to connect to the data projector from multiple points; creating many focal points in the layout; and bring the room to life with color) that this then allows the teacher to better utilize the affordances provided through technology. This, in turn, de-emphasizes the dominance of attention on the use of the device, as a replacement of the whiteboard/notebook. By moving beyond just replacing like for like, while removing the “fireplace” syndrome of the classroom, we are now enabling both teachers and students to utilize technology as a learning tool. An example of a benefit of our 1-to-1 tablet PC program has centered on the use of diagnostic assessment and differentiation in middle school Mathematics. Over the years we have utilized different devices and testing sites to conduct diagnostic and self-marking, pre- and post-testing. The aim is to allow each teacher to, in real time, acquire a detailed understanding of their class’ strengths and areas of attention needed, as well as that of each individual student. Teachers are then able to make informed decisions on how to modify the scope and sequence for that particular group of individuals. It also establishes a baseline for each student, who can then personalize their improvement through the unit. This enables teachers to identify what effect their teaching has had on each student in the class. Finally, it provides immediate feedback to individual students, and their parents, relating to what they need to focus their attention on when preparing for assessment. Favorite childhood memory: Making furniture in my grandfather’s workshop. When was the last time you laughed? Why? My Year 11 Mathematics C class. A group of students who are much smarter than I am and who want to be surgeons, pilots, etc., but still are humble enough to have laugh when we all make the silliest of mistakes. Your favorite quote or motto: This is what I start most of my teacher and parent presentation with: “Technology is just a tool. In terms of getting the kids working together and motivating them, the teacher is the most important.” – Bill Gates. This entry was posted in 1:1 Learning, 21st century skills, Building Teacher Capacity, Change Management and Culture of Innovation, Information, People, Personalized Learning, Physical Learning Environments. Bookmark the permalink.